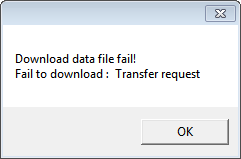 PC Downloader cannot connect to Asellertool hosting servers. Verify your computer has an active internet connection by using a browser. If an internet connection is present but download does not start, most likely a firewall/anti-virus program is blocking it. Disable any Firewall/Anti-Virus software on the computer and attempt the download again. !Some workplaces or public Internet locations may block the download of data from our sites as a matter of security policy. In cases like this, please ask your network administrator to add an exception for our program. 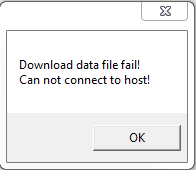 If you receive this error, it usually means that your connection with the download server was broken in the middle of downloading, and the program was not able to reconnect with it. This normally indicates that your internet connection went down in the middle of the download itself. Please make sure to check you are still connected to the internet before attempting the download again. If you have problems connecting to the Internet, you may wish to contact your Internet service provider. 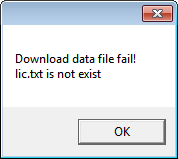 This message indicates the license key on your PDA does not match your account info from our servers. 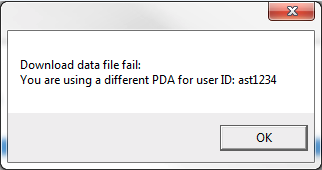 If you have recently changed PDAs or want to transfer your account to a new PDA, please contact Asellertool Support at www.asellertool.com/support/Contact.htm. 2) Have the proper path to the ‘asellertool’ folder typed in, without any typos. If you have done both of these and they do not solve the issue, please contact Asellertool support at http://www.asellertool.com/support/Contact.htm. 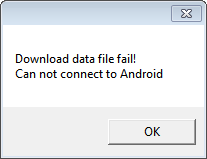 This error message will appear if the Downloader does not detect an attached Android device when attempting to download in Media Device/PC Mode. Please make sure your android device is properly connected to the computer, and does show up in the ‘Computer window when viewed. If it does not show up in the ‘Computer’ window when it is connect, please try another USB port or cord, or look to see if drivers have to be updated. We do have a backup method of downloading called a ‘Web Download’. This will have you log into a website and download the data files directly through your Web Browser, and then manually copy them from the computer to the SD card, or to the proper directory on your Android device. A tutorial on downloading to the SD card in this way can be found at www.asellertool.com/support/WebDownload.htm, and the download itself can be found at www.asellertool3.com/WebDownload90/Download.aspx. !The Web Download method should only be used if you are unable to download to the smartphone via WiFi or PC Downloader, as it has more steps and can be more complicated. If you feel you may need to do a Web Download, please contact us at www.asellertool.com/contact.html.